Over the years I have seen many of my favorite bands live but there is a growing list of bands I want to see. With the Dream Concert feature, I usually list the set list and venue of my choice for one of my favorite bands that I have yet to experience live. My current selection is Love of Everything. I have been a fan since I reviewed their latest album this past April and I am happy that I don't have to wait long for the chance to see them live. On Thursday July 8th, Love of Everything is coming to Blind Bob's in Dayton and I will be there and you should too! Bobby Burg of Love Of Everything a busy man. He runs his own record label called ‘Record Label’ and plays or has played in many great Chicago bands such as Vacations, Make Believe, Chin Up Chin Up and Joan of Arc. The album Best in Tensions debuted in April and features Bobby’s short and sweet, quirky bedroom-pop songs and includes his wife, Elisse La Roche on drums. That video is great! 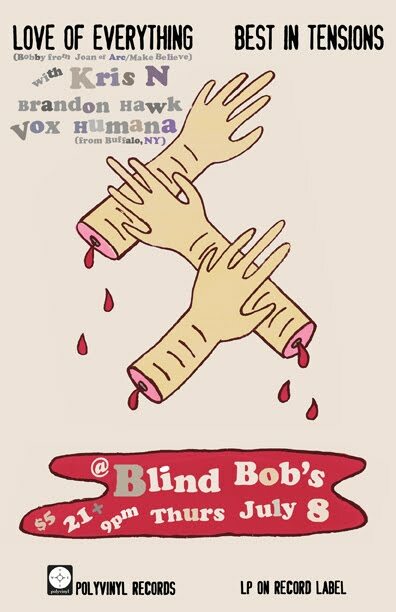 See you at Blind Bob's on July 8th!